It has been a very newsworthy couple of months regarding ships as the UK cruise industry reaches out towards two million annual packages. It has not made it yet (1.7m is predicted for this year) but there is much new capacity being very publicly unveiled, and the established stars are also doing well in the publicity stakes. The Queen named Britannia in March; Anthem of the Seas made its debut just a few weeks later and BTN in this issue introduces Explorer of the Seas following a major refurbishment. Liverpool set new standards for city hospitality when it hosted Cunard’s three Queens last week. It was a joyous homecoming for the line which was founded 175 years ago by a Canadian gentleman from Halifax, Nova Scotia. 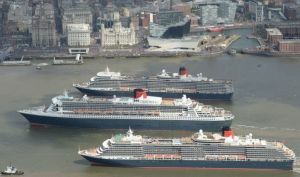 Sir Samuel Cunard would have been proud of Queen Mary 2, Queen Elizabeth and Queen Victoria as they steamed in line astern past the magnificent Cunard Building (once the company headquarters) and the much newer Liverpool Cruise Terminal. The weather was perfect and the crowds enormous. The TV and newspaper coverage was enormous, worldwide. Liverpool Maritime Mercantile City is a UNESCO World Heritage Site. The Riverside Walk offered fantastic views of the ships and overlooks the small cruising dock facility. The single ship berth is far too short for QM2, 1132ft long, the ship extending over 300ft at the sharp end. Cunard’s first ship Britannia departed on her maiden voyage from Liverpool to Boston via Halifax on 4 July 1840. On 30 January 1968 Franconia made the last Cunard departure from Liverpool to New York, the company saying that the service had been “suspended”. 4 July this year will see QM2 leaving once again for New York. For the record Queen Mary docked on Sunday morning (24 May) facing downstream, a tricky manoeuvre according to Captain Christopher Wells, and spent the day being viewed by massive crowds on the quayside. 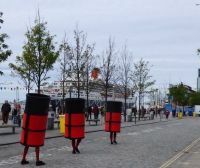 Those on board were able to disembark and take in some of what Liverpool has on offer including The Beatles Experience, Museum of Liverpool, and the Merseyside Maritime Museum on the Albert Dock. The ‘City Explorer’ bus, hop-on-hop-off, ran just by the terminal and provided a one hour tour of the city including the Cavern Quarter, both the Metropolitan Catholic Cathedral, "Paddy's Wigwam", and the more traditional Liverpool Cathedral, in Gothic style by Sir Giles Gilbert Scott, designer of Battersea Power Station and the obsolescent red telephone box. The South John Street shopping complex provided a background to “The Crossing”, a 3D sound rendition of the relationship of Liverpool and New York. The quayside (Riverside Walk) offered a wide promenade, the City of Liverpool providing plenty of music and entertainment. For the locals, and the not so locals, the occasion provided a fine (free) day out. The Sunday evening included a VIP dinner in the Todd English restaurant on board QM2 for the Lord Lieutenant of Lancaster, Lord Mayor of Liverpool and 100 VIP guests including Michael (Lord) Heseltine, who led the regeneration of Liverpool in his time as a Cabinet Minister and is now a Freeman of the City. The Three Graces, the Royal Liver Building, Cunard Building and the Port of Liverpool Building formed the backdrop for a 'light' show. A massive firework display followed. The Monday will be remembered for a long time, QM2 leaving her berth at 10:45 to join Queen Elizabeth sailing in from Kirkwall in the Orkney Islands, and Queen Victoria from Guernsey. The ships then passed The Three Graces, the Red Arrows did a flypast. By 14:30 “Mary” was on her way to Guernsey and with “Elizabeth” docking at the terminal. How much smaller she seemed. “Victoria” moored in the Mersey opposite, the Mersey Ferries providing a tender service for her visiting passengers. Late on Monday evening “Elizabeth” left for Southampton, allowing “Victoria” to dock. It was not until late Tuesday afternoon that Victoria departed, Southampton bound too, followed by a flotilla of small boats. Sadly the party was over. As noted Queen Mary 2 is due to return on 4 July, American Independence Day, to re-enact the first transatlantic crossing from Liverpool to the New World in 1840 – with 400 of her passengers embarking in the city for the journey to Halifax, Boston and New York. Andrew Struthers, Cunard Commercial Director, hosted a press conference at the Crowne Plaza hotel on the quayside. “175 years is a very special milestone, and we’re delighted we’ll be embarking 400 people to cross the Atlantic. 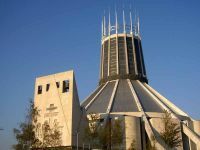 It will be the first time people will have been able to embark at Liverpool to cross the Atlantic for nearly 50 years. Sadly however, the facilities at the Cruise Terminal do not allow for a full ship turnaround. But Liverpool will continue to be a very special part of Cunard and long may we continue to come to Liverpool in years to come. To be fair to Liverpool noises are being made regarding a development of the docking facility. Liverpool is now a tourist city. Some say this is because of The Beatles, but Cunard would argue that it was Sir Samuel who started it all off. Large cruise ships now visit the Mersey but it is usually one at a time, and just for the day, no overnights, nor as a turnaround port. Cunard seems willing to return on a more permanent basis. Mr Struthers made his point. “Yesterday all the ships were turned away. For the monthly cruising supplement (See "Billion Dollar Cruise Ship" BTN 4 May issue) reported on the spectacular naming ceremony for Anthem of the Seas. 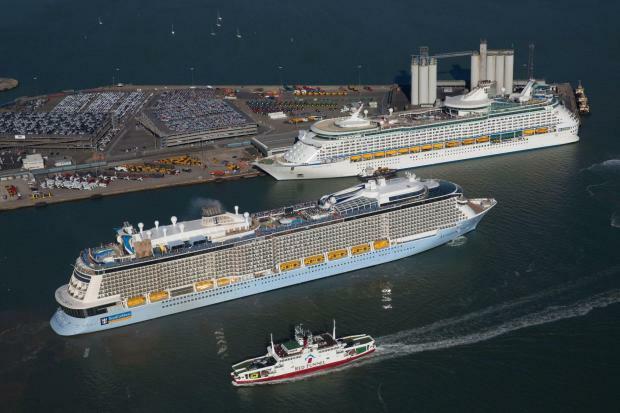 It was a 48-hour (Monday-Tuesday) extravaganza with the Wednesday a sort of day of rest before returning to the Southampton dockside for the arrival of Explorer of the Seas, she having just taken part in a 40-day, US$100m bow-to-stern full revitalisation. Just to put it all in perspective Explorer of the Seas was the second of Royal Caribbean Cruise Line’s (RCCL) Voyager series in 2000, at 137,000 tonnes, the world‘s largest cruise ship at the time with a 3,100-bed passenger capacity. Anthem, 2015, is 167,000 tons and 4,100 souls. RCCL got it more less right with “Explorer” but after 15 years a midlife update offered the chance for the latest ideas and technology to be added, the most ambitious being 81 new Virtual Balcony Staterooms – an innovative design concept unique to Royal Caribbean which offers expansive real-time views of the ocean and destinations from an inside cabin. We are told you will not be seasick if the ship has any motion, your balcony video view will go up and down but your brain is even cleverer not noticing the movement. (In any case there is a very sophisticated stabilising system fitted). Highlights of Explorer of the Seas’ revitalisation include 24 new Panoramic Ocean View Staterooms, offering floor to ceiling wraparound panoramic windows. All the cabins (the Americans like to call them staterooms, which sounds posher) have been re-carpeted and flat screens added. There are 1,557. For the Southampton cruising season coffee and tea making machines have been added to the cabins (staterooms if you like). She in in New Zealand during our winter. They appreciate tea as well. But will they be put away when back in the US market, or are we going educate the Yanks? One American tradition does remain for the European season. Any extras have an 18% tip added. Two innovations copied from later Royal Caribbean ships are bound to be popular. A 40ft FlowRider surf simulator and a 220sq ft outdoor cinema screen showing first-run movies, big sporting events and giant video game challenges. Done away with is the printing of all those unwanted photographs and the search. The print-on-demand Focus Photo Gallery makes it very easy. The art gallery is now spread throughout the ship displaying original works. Revamped restaurants and bars include Giovanni’s Table traditional trattoria, Chops Grill steak house, Izumi Japanese cuisine, R Bar and The Tavern sports bar. The Card Room (tables for cards and complimentary board games), The Diamond Club, NextCruise and Star Lounge are all new. Finally we are assured of the same wi-fi installation as Anthem of the Seas, certainly the quickest experienced to date at sea, and in fact faster/as fast as BTN’s office. Two weeks in the Med with a teenage grandson. We will be reporting on a family friendly ship.